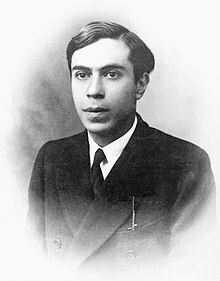 Ettore Majorana (/ˌmædʒəˈrænə/; Italian: [ˈɛttore majoˈraːna]; born on 5 August 1906 – probably died after 1959) was an Italian theoretical physicist who worked on neutrino masses. On March 25, 1938, he disappeared under mysterious circumstances while going by ship from Palermo to Naples. The Majorana equation and Majorana fermions are named after him. In 2006, the Majorana Prize was established in his memory. There are several categories of scientists in the world; those of second or third rank do their best but never get very far. Then there is the first rank, those who make important discoveries, fundamental to scientific progress. But then there are the geniuses, like Galilei and Newton. Majorana was one of these. Majorana was born in Catania, Sicily. Mathematically gifted, he was very young when he joined Enrico Fermi's team in Rome as one of the "Via Panisperna boys", who took their name from the street address of their laboratory. His uncle Quirino Majorana was also a physicist. He began his university studies in engineering in 1923 but switched to physics in 1928 at the urging of Emilio Segrè. His first papers dealt with problems in atomic spectroscopy. His first paper, published in 1928, was written when he was an undergraduate and coauthored by Giovanni Gentile, Jr., a junior professor in the Institute of Physics in Rome. This work was an early quantitative application to atomic spectroscopy of Fermi's statistical model of atomic structure (now known as the Thomas–Fermi model, due to its contemporaneous description by Llewellyn Thomas). In this paper, Majorana and Gentile performed first-principles calculations within the context of this model that gave a good account of experimentally-observed core electron energies of gadolinium and uranium, and of the fine structure splitting of caesium lines observed in optical spectra. In 1931, Majorana published the first paper on the phenomenon of autoionization in atomic spectra, designated by him as "spontaneous ionization"; an independent paper in the same year, published by Allen Shenstone of Princeton University, designated the phenomenon as "auto-ionization", a name first used by Pierre Auger. This name has since become conventional, without the hyphen. Majorana earned his Laurea in physics at the University of Rome La Sapienza in 1929. In 1932, he published a paper in the field of atomic spectroscopy concerning the behaviour of aligned atoms in time-varying magnetic fields. This problem, also studied by I.I. Rabi and others, led to an important sub-branch of atomic physics, that of radio-frequency spectroscopy. In the same year, Majorana published his paper on a relativistic theory of particles with arbitrary intrinsic momentum, in which he developed and applied infinite dimensional representations of the Lorentz group, and gave a theoretical basis for the mass spectrum of elementary particles. Like most of Majorana's papers in Italian, it languished in relative obscurity for several decades. Experiments in 1932 by Irène Joliot-Curie and Frédéric Joliot showed the existence of an unknown particle that they suggested was a gamma ray. Majorana was the first to interpret correctly the experiment as requiring a new particle that had a neutral charge and a mass about the same as the proton; this particle is the neutron. Fermi told him to write an article, but Majorana didn't bother. James Chadwick proved the existence of the neutron by experiment later that year, and he was awarded the Nobel Prize for this discovery. Majorana was known for not seeking credit for his discoveries, considering his work to be banal. He wrote only nine papers in his lifetime. "At Fermi's urging, Majorana left Italy early in 1933 on a grant from the National Research Council. In Leipzig, Germany, he met Werner Heisenberg. In letters he subsequently wrote to Heisenberg, Majorana revealed that he had found in him, not only a scientific colleague, but a warm personal friend." The Nazis had come to power in Germany as Majorana arrived there. He worked on a theory of the nucleus (published in German in 1933) which, in its treatment of exchange forces, represented a further development of Heisenberg's theory of the nucleus. Majorana also travelled to Copenhagen, where he worked with Niels Bohr, another Nobel Prize winner, and a friend and mentor of Heisenberg. "In the fall of 1933, Majorana returned to Rome in poor health, having developed acute gastritis in Germany and apparently suffering from nervous exhaustion. Put on a strict diet, he grew reclusive and became harsh in his dealings with his family. To his mother, with whom he had previously shared a warm relationship, he had written from Germany that he would not accompany her on their customary summer vacation by the sea. Appearing at the institute less frequently, he soon was scarcely leaving his home; the promising young physicist had become a hermit. For nearly four years he shut himself off from friends and stopped publishing." During these years, in which he published few articles, Majorana wrote many small works on geophysics, electrical engineering, mathematics, and relativity. These unpublished papers, preserved in Domus Galileiana in Pisa, recently have been edited by Erasmo Recami and Salvatore Esposito. He became a full professor of theoretical physics at the University of Naples in 1937, without needing to take an examination because of his "high fame of singular expertise reached in the field of theoretical physics", independently of the competition rules. Majorana's last-published paper, in 1937, this time in Italian, was an elaboration of a symmetrical theory of electrons and positrons. In 1937, Majorana predicted that in the class of particles known as fermions there should be particles that are their own antiparticles. This is the so-called Majorana fermion. Solution of Majorana's equation yields particles that are their own anti-particle, now referred to as Majorana Fermions. In April 2012, some of what Majorana predicted may have been confirmed in experiments on hybrid semiconductor-superconductor wire devices. These experiments may potentially lead to a better understanding of quantum mechanics and may help build a quantum computer. There has also been speculation that at least some part of the "missing mass" in the universe, which cannot be detected except by inference of its gravitational influences, may be composed of Majorana particles. Majorana did prescient theoretical work on neutrino masses, a currently active subject of research. He also worked on an idea that mass may exert a small shielding effect on gravitational waves, which did not gain much traction. I made a decision that has become unavoidable. There isn't a bit of selfishness in it, but I realize what trouble my sudden disappearance will cause you and the students. For this as well, I beg your forgiveness, but especially for betraying the trust, the sincere friendship and the sympathy you gave me over the past months. I ask you to remember me to all those I learned to know and appreciate in your Institute, especially Sciuti: I will keep a fond memory of them all at least until 11 pm tonight, possibly later too. This was followed rapidly by a telegram cancelling his earlier plans. He apparently bought a ticket from Palermo to Naples and was never seen again. proposed the Rai 3 talk show "Chi l'ha Visto?" published a statement stating that Majorana was alive between 1955 and 1959, living in Valencia, Venezuela. The Italian writer Leonardo Sciascia has summarized some of the results of these investigations and these hypotheses, however, some of Sciascia's conclusions were refuted by some of Majorana's former colleagues, including E. Amaldi and E. Segrè. Recami critically examines various hypotheses for Majorana's disappearance who various rival explanations concerning Majorana's disappearance, including those advanced by Sciascia, and presents suggestive evidence for the proposal that Majorana travelled to Argentina. Italian philosopher Giorgio Agamben has also recently published a book that examines the case of Majorana's disappearance. In March 2011, Italian media reported that the Rome Attorney's Office had announced an inquiry into the statement made by a witness about meeting with Majorana in Buenos Aires in the years after World War II. On 7 June 2011 Italian media reported that the Carabinieri's RIS had analyzed a photograph of a man taken in Argentina in 1955, finding ten points of similarity with Majorana's face. On 4 February 2015, the Rome Attorney's Office released a statement declaring that Majorana was alive between 1955–1959, living in Valencia, Venezuela. These last findings, based on new evidence, made the Office declare the case officially closed, having found no criminal evidence related to his disappearance which probably was a personal choice. The year 2006 marked Majorana's centenary. An international conference on "Ettore Majorana's legacy and the Physics of the XXI century" was held in commemoration of the centennial of Majorana's birth in Catania, October 5–6, 2006. The conference proceedings with articles of highly ranked international scientists A. Bianconi, D. Brink, N. Cabibbo, R. Casalbuoni, G. Dragoni, S. Esposito, E. Fiorini, M. Inguscio, R. W. Jackiw, L. Maiani, R. Mantegna, E. Migneco, R. Petronzio, B. Preziosi, R. Pucci, E. Recami, and Antonino Zichichi have been published by POS Proceedings of Science of SISSA, edited by Andrea Rapisarda (chairman), Paolo Castorina, Francesco Catara, Salvatore Lo Nigro, Emilio Migneco, Francesco Porto, and Emanuele Rimini. A commemorative book of his nine collected papers, with commentary and English translations, was published by the Italian Physical Society in 2006. Also to commemorate the centenary, the journal, Electronic Journal of Theoretical Physics] (EJTP), published a special issue of twenty articles dedicated to the modern development of Majorana's legacy. The Electronic Journal of Theoretical Physics also established a prize in his memory to mark the centenary. The Majorana Medal or Majorana Prize is an annual prize for researchers who have shown peculiar creativity, critical sense, and mathematical rigour in theoretical physics—in its broadest sense. The recipients of the 2006 Majorana Prize were Erasmo Recami (University of Bergamo and INFN) and George Sudarshan (University of Texas); of the 2007 Majorana Prize: Lee Smolin (Perimeter Institute for Theoretical Physics, Canada), Eliano Pessa (Centro Interdipartimentale di Scienze Cognitive, Università di Pavia and Dipartimento di Psicologia, Università di Pavia Piazza Botta, Italy) and Marcello Cini (Dipartimento di Fisica, Università La Sapienza, Roma, Italy). ^ Great Mysteries of the Past, Reader's Digest Association, Pleasantville, New York, 1991, pp. 69-72. ^ Ettore Majorana: genius and mystery, CERN courier. ^ a b Great Mysteries of the Past, Reader's Digest Association, Pleasantville, New York, 1991, p. 71. ^ a b c Holstein, B. (16 May 2008). "The Mysterious Disappearance of Ettore Majorana" (PDF). USC Neutrino Symposium. Retrieved 5 April 2009. ^ Bascone; Venturini, Franco (2010). "'La vera storia di Ettore Majorana' al Teatro Flavio". Archived from the original on 4 March 2016. Retrieved 17 October 2015. ^ Sciascia, Leonardo (1975). La Scomparsa di Majorana [The Moro Affair and The Mystery of Majorana]. Einaudi, 1975; Carcanet, 1987. ISBN 978-0-85635-700-8. ^ Recami, Erasmo (2000). Il caso Majorana: Lettere, testimonianze, documenti. Roma, IT: Di Renzo Editore. ^ Recami, Erasmo (1975). 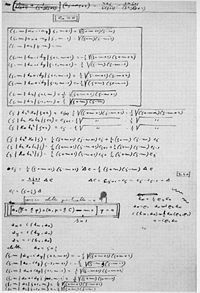 "I nuovi documenti sulla scomparsa del fisico Ettore Majorana" [New evidence on the disappearance of the physicist Ettore Majorana]. Scientia (in Italian). 110: 577–588. ^ Recami, Erasmo (1975). "New evidence on the disappearance of the physicist Ettore Majorana". Scientia. 110: 589 ff. ^ Agamben, Giorgio (2016). Che cos'è reale? La scomparsa di Majorana [What is Real? The Disappearance of Majorana]. Neri Pozza. ^ "Il mistero Majorana si riapre dopo 73 anni - Cronaca". ANSA.it. Retrieved 29 April 2013. ^ "Adnkronos Cronaca". Adnkronos.com. 1 April 2011. Retrieved 29 April 2013. ^ "È il volto di Majorana, 10 punti uguali". Corriere della Sera. Retrieved 2013-04-29. ^ "Ettore Majorana mystery might be solved". Quantum Diaries. 79823. ^ "Ettore Majorana's legacy and the Physics of the XXI century". Proceedings of Science. Retrieved 11 July 2017. ^ Majorana, Ettore (2006). Bassani, G F, ed. Scientific Papers on occasion of the centenary of the birth. Bologna: SIF. ISBN 978-88-7438-031-2. For a summary of Majorana's scientific output, see the following article (in Italian): E. Amaldi, "L'opera scientifica di Ettore Majorana", Physis, vol. X, pp. 173–187 (1968). Majorana's collected papers, accompanied by English translations and commentaries, were published in Ettore Majorana Scientific Papers on the occasion of the centenary of the birth. Carlo Artemi, Il plano Majorana: una fuga perfetta ( The Majorana plan: a perfect escape), De Rocco press, Rome, 2007. E. Amaldi, Ricordo di Ettore Majorana, Giornale di fisica, 9, 1968. E. Recami, Il caso Majorana, Di Renzo Editore, Roma, 2001. I. Bascone, Tommaso l'omu cani amara e miserabile ipotesi sulla scomparsa di Ettore Majorana fisico siciliano al tempo del fascismo, ed. Ananke, 1999. I. Licata (ed), Majorana Legacy in Contemporary Physics, Di Renzo Editore, Roma, (2006). L. Castellani, Dossier Majorana, Fratelli Fabbri, 1974 (edited again in 2006). L. Sciascia, La scomparsa di Majorana, Adelphi ed., 1975. S. Bella, Rivelazioni sulla scomparsa di uno scienziato : Ettore Majorana, Italia letteraria, 1975. Esposito, S. (2008). "Ettore Majorana and his heritage seventy years later". Annalen der Physik. 17 (5): 302–18. arXiv:0803.3602. Bibcode:2008AnP...520..302E. doi:10.1002/andp.200810296. Reader's Digest Association, Great Mysteries of the Past, Pleasantville, New York, 1991, ISBN 0-89577-377-5, pp. 69–72. U. Bartocci, La scomparsa di Majorana: un affare di stato?, ed. Andromeda, 1999. M. Pizzi, The Majorana Sea, a play in three acts, Amazon KDP, 2014 (English translation of Il mare di Majorana, Teatro Helios Prize, 2012). Salvatore Esposito, Ettore Majorana - Unveiled Genius and Endless Mysteries, Springer Biographies, Springer International Publishing, 2017. ISBN 978-3-319-54318-5. Ettore Majorana: genius and mystery, by Antonino Zichichi. CERN Courier: Ettore Majorana: genius and mystery (summary of the above link). This page was last edited on 13 April 2019, at 19:05 (UTC).